MONACO (Kyodo) -- Yoshiro Mori, the chairman of the 2020 Tokyo Olympics organizing committee, indicated Tuesday he intends to set up a review board in the near future to determine how to select additional events for the Summer Games. Mori announced the plan a day after the International Olympic Committee unanimously approved 40 sweeping reforms, which included the scrapping of the cap of 28 sports in the Olympic program. About seven people will constitute the review board, including representatives from the Tokyo metropolitan government, the Japan Olympic Committee, the organizing committee and academic experts, he said. 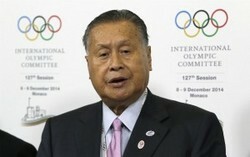 "Not spending money will be a very important point for the Olympics that follow," said Mori. "I will have everyone debate the increase in the number of athletes, and the question of what will happen with facilities." Candidates for inclusion will be narrowed down by the review board before a decision is made at the organizing committee's executive meeting and later proposed to the IOC. Baseball/softball, karate and squash are among the events being considered as additions to the program. Aside from the change to the program framework, IOC President Thomas Bach's proposal to allow events to be held outside of the host city or country, but only in extenuating circumstances, was also given the green light. Mori has suggested that, in principle, Tokyo's Games will be held "in the metropolitan area or in a corresponding region to the metropolitan area." The former prime minister is also floating the idea of holding qualifiers in regions hit by the 2011 Tohoku earthquake and tsunami. "It probably wouldn't be a bad idea to bring some of the competition qualifiers to areas like Fukushima or Iwate," he said.